Sidecar teams booking testing should select the half-day option at the bottom. You must be logged in to book an entry. Click here to register if you are not a member. GP (Race Bike) GPF (Production/Road Bike) Is this your MAIN CLASS? Rookie? Is this your MAIN CLASS? Is this your MAIN CLASS? Clubman Rookie? Is this your MAIN CLASS? MRO Clubman 1000 Cup Is this your MAIN CLASS? MRO Clubman 600 Cup Is this your MAIN CLASS? Please note that Rookies will be given priority and an instructor cannot be guaranteed, however we always do our best! If this is selected, tickets for MSV venues will be emailed to you or downloaded from this site and printed at home. This saves the club postage costs and is more convenient for you. 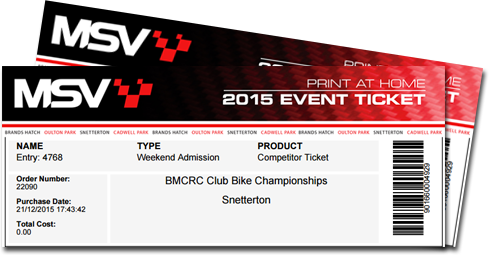 You will be able to collect your scrutineering card on the Friday or the Saturday morning from the Race Office. Remember that Annual members don't have to pay now. Simply register your Debit/Credit card and we will automatically take payment approximately 1 week before the meeting.